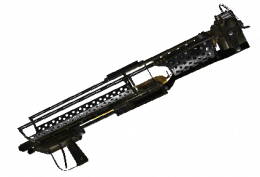 The most deadly weapon known to man made man-portable. On top of that, it shoots 8 mini-nukes simultaneously so you can wipe your unfortunate foes like a rabid deathclaw or an Enclave patrol off the face of the Earth with a miniature nuclear holocaust. Nothing else really needs to be said.